Davo pulled out a smallish wooden box, and opened it to display the pieces of something which had been savagely destroyed, probably by bashing it against a hard object. Xoraya clucked sadly to see them, and then rooted among the broken components until she came up with a transparent crystalline object attached to metal casings at both ends. 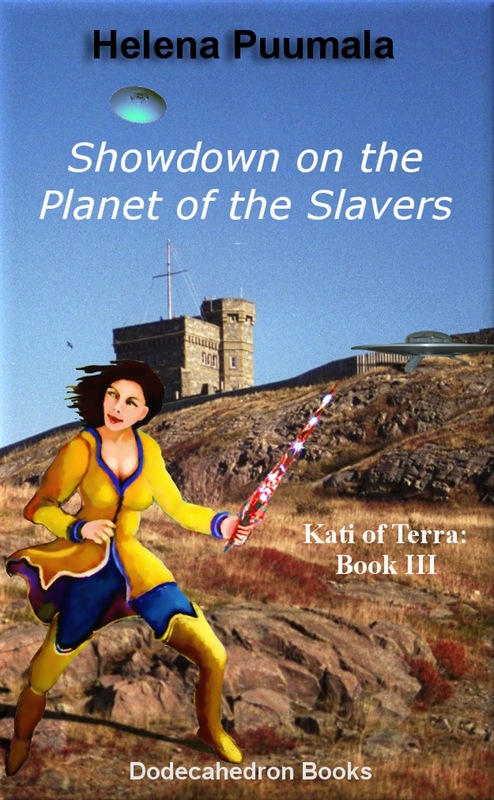 From Kati of Terra Book Three: Showdown on the Planet of the Slavers. In Kati of Terra Books 2 and 3, a particularly deadly type of weapon is described, “the lace crystal knife”. As the above selection states, it is incredibly sharp, as well as having certain other characteristics, relating to its resonator properties. That makes one wonder, in our world, what is the sharpest blade that has been made? First, let’s think about what we mean by sharpness, in this context. I would say we are talking about penetrating power, and specifically penetrating power focussed on a small surface area, that doesn’t cause much damage outside of the intended area of penetration. That would produce what we would call a clean cut. After all, a missile, artillery shell or bullet has a lot of penetrating power, but they tend to do a lot more damage than required - we generally don’t want to destroy the object that we are cutting, particularly if we are engaged in activities like surgery or preparing thin samples for microscopes. Even with weaponry, the idea behind an edged weapon is to overpower the opponent without doing a lot of collateral damage. That’s certainly the idea behind the assassin‘s weapon, the lace crystal knife, in the Kati of Terra books. So, cutting power or penetrating power, is a matter of applying a lot of force over a small area – in other words, pressure or force per unit area. We can work out a few examples, using Kati as a model (she’s always willing to help) – these will all just be ballpark figures, to get some feel for the physics involved. First, let’s assume that Kati of Terra weighs about 115 pounds, and is wearing her regular hiking boots, that have dimensions of roughly 3 inches by 10 inches. That gives 115 pounds divided by 30 square inches, or about 4 pounds per square inch pressure. Now, let’s have her put on some high heels, with a heel dimension of about 1 inch square. If we assume half of her weight is on the heel, then the resulting pressure is about 60 pounds per square inch under that spiked heel. So, the pressure that can be exerted by that spiked heel is now about 15 times as much as with the hiking boots. Now, let’s try some ice skates. We will assume the blades are about one eighth inch thick, which then yields a pressure of about 92 pounds per square inch, on average over the blade. But when stopping, accelerating or turning, the surface area might go down considerably, perhaps to only one-tenth of that value, thus yielding a pressure of 920 pounds per square inch, for very short time intervals. No wonder the ice chips fly, and hockey players can be badly cut by an opponent’s skates. Naturally, that is compounded by the fact that the hockey player’s skate might be traveling quite fast when it collides with the other player. That would multiply the effective force by many times (the blade decelerates in a small distance/time interval, so it and anything it collided with would probably be experiencing a significant g-force). Obviously, blades can get a lot sharper than a skate blade – a lot shaper. In fact, it turns out that human beings have been making very sharp blades for a long time, since some of the sharpest edges attainable are via amorphous materials like glass, in particular volcanic glass or obsidian. Apparently, obsidian can be fractured down to points that are only molecules wide, tapering to a very fine point, due to their amorphous structure and consequent conchoidal fracture. That’s harder to do with more rigid crystalline structures such as diamond – at the molecular level they want to maintain their structure, so there is a limit to how sharp a point they can come to (though diamond blades can be made very sharp, as well). And people have had access to natural obsidian for as long as we have been making tools, so our primitive ancestors had surprisingly sharp knives. Mesoamericans had quite fearsome weapons, swords that incorporated obsidian blades along with wooden serrated edges, which could result in terrible wounds. Apparently, obsidian is still used for some of the sharpest surgical tools, to cut rather than tear at the cellular level. This also gives one a new appreciation of the implications of the term “The Obsidian Order” in Star Trek Deep Space Nine”. 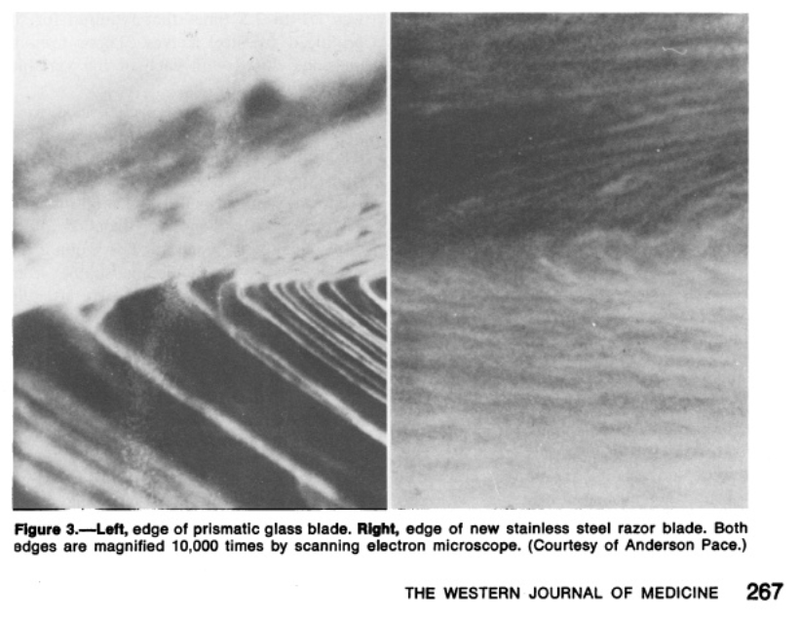 Here's a scanning electron microscope photo of an obsidian blade and a steel blade. The down side to obsidian or glass cutting instruments is that they can get dull after a limited number of uses. Once the cutting edges are down to molecules thick, even small lateral forces can cause them to chip or break, so they can wear down fairly quickly. For this reason, metal blades are much more useful, generally speaking. With hardened steel, for example, sharpness and toughness or durability can be combined. Even here, the techniques are old – something called Damascus Steel was used for swords for many centuries before the techniques for creating it were forgotten, within the recent past. It has been difficult to exceed these blades, in practice. In fact, they have been found to include carbon nanotubes, a modern materials science mainstay. As for lasers, apparently the best medical lasers can be very finely focussed, down to the 25 micron level or so (a micron is a millionth of a meter or thousandth of a millimeter). But the finest obsidian blades actually go down to the nanometers level (a billionth of a meter or a millionth of a millimeter), so lasers are still rather crude in this regard. As for the lace crystal knife of the Kati of Terra universe, its many amazing properties may be the result of its ability to focus energy from the quantum level, the so-called zero-point or vacuum energy. That can be seen by the scintillation of the lace crystal knife that Kati has in her hands on the cover of Kati 3. Perhaps the cutting edge can be deformed from its usual crystalline structure at the micro level, via zero-point energy, the way water molecules can be elongated in an extremely strong magnetic field, such as those near the astrophysical bodies known as magnetars. This would also help explain the apparent psychic or mental connection that some species, notably the Chrystallorians seem to have with the material. After all, we all know that there appears to be some kind of connection between consciousness and matter, when you get down to the quantum realm, based on ideas like the collapse of the wave function. Lace crystal just happens to have properties that accentuate that phenomenon. At any rate, that’s Science Fiction – it’s anything from a lot of Science and a little Fiction to a little Science and a lot of Fiction. And what seems like fiction in the present, may become the science of the future.